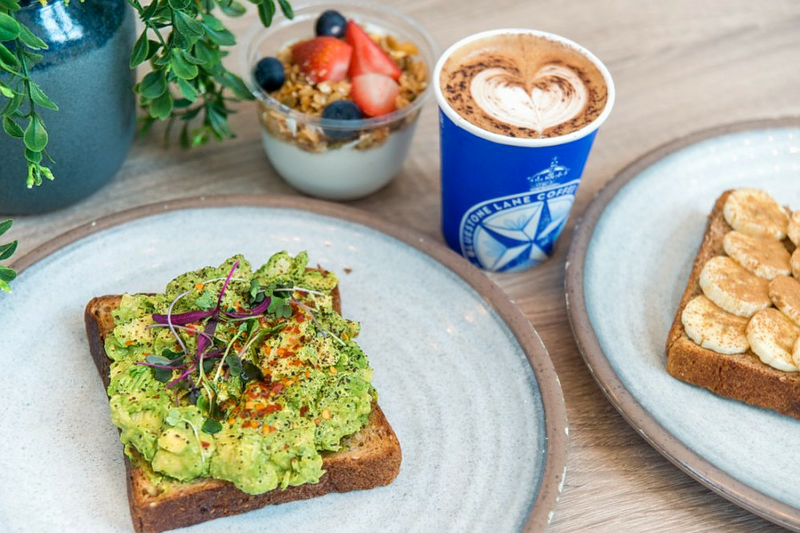 Looking for a new spot to grab your morning coffee and breakfast in the Financial District? You're in luck: Bluestone Lane has arrived at 225 Bush St. -- the former location of Coffee Cultures. As we previously reported, this is one of three new locations for the international Australian-inspired shop, behind previous openings on Front Street at Halleck Alley and Market at Annie Street. At the new Bush Street spot, the drink menu includes premium coffee, cold-pressed juices and "wellness lattes" -- such as matcha green tea, the turmeric-infused Golden Latte, and a beet latte made with almond milk and dehydrated beet powder then topped with cocoa powder. Bluestone Lane also has a selection of loose-leaf teas on hand, like lemongrass ginger and China green. As for food, the newcomer offers oatmeal and a selection of toasts, including avocado, banana and salmon. With a four-star rating out of three reviews on Yelp so far, Bluestone Lane has received a good response in its early days. Adriana R., who reviewed the new spot on November 27, said, "Thank goodness for accessible, quality coffee. I work upstairs and will miss Coffee Cultures for their pumpkin froyo, but this is a major upgrade to my coffee game. I get the Long espresso, which is their version of an Americano. It's the perfect morning pick me up." And Erica A. added, "My new favorite place to grab coffee and a quick toast. The avocado and banana toasts are my favorite. The Magic is my favorite coffee drink, it's basically just a slightly bigger cortado."